Brinkley & Prince are looking for a good home. 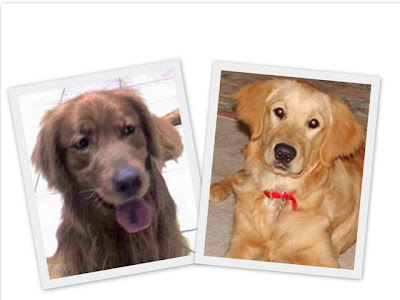 Hello Friends, just want to share with you all a wonderful page on Golden Retriever Rescues. If you know someone looking for a golden retriever companion, please ask them to check out the link above. Thanks! Update: Adopted (January 2010) Woohoo!!! Hope they both find a new home soon. How nice of you to publish it here. I too wish they find a forever family soon. We have been your fans for a long time. We just want to say thank you for bringing great joys to us. It is espeically comforting to visit and see how you are doing after our doggy Squarky passed away this February. We wish we could adopt one of them but we are far away in Shanghai. We hope they will find good homes soon. We love you! And keep up your good work!